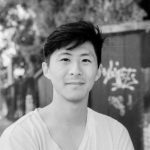 Michelle Zheng, Roger Kim and Ben Zucker are the winners of SF Search 2016-17. Selected works of the winners will be performed by San Francisco Contemporary Music Players at the April 2017 Lou Harrison Centenary Celebration. With his focus on the openness of Lou Harrison’s melodies and the lushness of microtonal harmonies, Roger Kim has constructed a piece of quiet beauty and generous space for the performer. 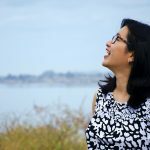 From her childhood, near Lou Harrison’s Aptos home, Michelle Zheng was able to experience first hand the unique qualities of the light along the mid-Californian coast and its unique blend of cultures. In her work, full of musical contrast and shifting emotions, she captures this mixture with grace and skill. Benjamin Zucker simultaneously explores the dual personality of Lou Harrison, as an American composer indebted to the musical language of the gamelan, and as an American experimentalist. Through an unusual notational and musical scheme, Zucker captures both. 2016-17 CALL FOR SCORES IS NOW CLOSED. CHECK BACK FOR 17-18 CALL FOR SCORES. 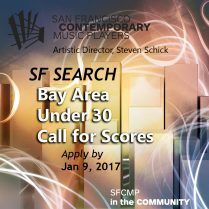 San Francisco Contemporary Music Players (SFCMP) artistic director Steven Schick is pleased to invite applications for SFCMP’s SF Search 2016-17: Under-30 Call for Scores. Composers from the San Francisco Bay Area who are under 30 years of age on January 9, 2017, are invited to submit an original composition that if selected, will be performed by the Players. Each composer is asked to submit a score no more than six minutes in length for the following instrumentation: piano, violin, cello and clarinet. The work should reflect the influence of composer Lou Harrison. 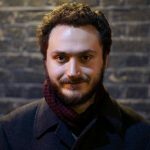 Three under-30 composers will be selected by a panel consisting of artistic director Steven Schick, composer Ken Ueno and two SFCMP Players. Each selected composer’s work will be read in a rehearsal on Friday, April 21, followed by feedback from San Francisco Contemporary Music Players musicians, artistic director Steven Schick, and composer Ken Ueno. The three selected works will be performed on Saturday, April 22, 2017, by the San Francisco Contemporary Music Players on its two-day Lou Harrison Centenary Celebration Weekend Festival celebrating the Harrison Centennial. Selected composers will also receive an archival recording of the work and a $500 stipend. Are there available doublings for the clarinet player, e.g., bass clarinet? Yes, if the playing of the two instruments is by a single player. Would the use of small objects and percussion by the ensemble be permissible? As long as the objects/percussion can easily be played by non-percussionists and, if needed, the composer must provide them. Can the piano be prepared? Absolutely, as long as it won’t damage our rented concert piano. How comfortable are the players with alternate tunings? If the score contains alternate tunings, the panel would like to see the score before submitting it. Is the full ensemble instrumentation required?